While we continue to have teachers and other staff members living on government assistance, in subsidized housing, and working multiple jobs; and we continue to have an alarming number children in crisis with a suicide rate in Colorado that is double the national average, and cannot retain behavioral health professionals due to our inability to pay these staff members, it is with deep regret that we write to you about our experience with FirstBank. FirstBank made a large donation on September 21, 2018 to the No on Amendment 73 campaign, $17,500. Due to their actions, we will move our accounts to a company that will truly stand behind their promise to support public education fully. On Friday, October 26, at 8:30 a.m., Shawna had a meeting with FirstBank CEO Jim Reuter and COO Emily Robinson. The meeting lasted less than 20 minutes and the drive back and forth was longer. 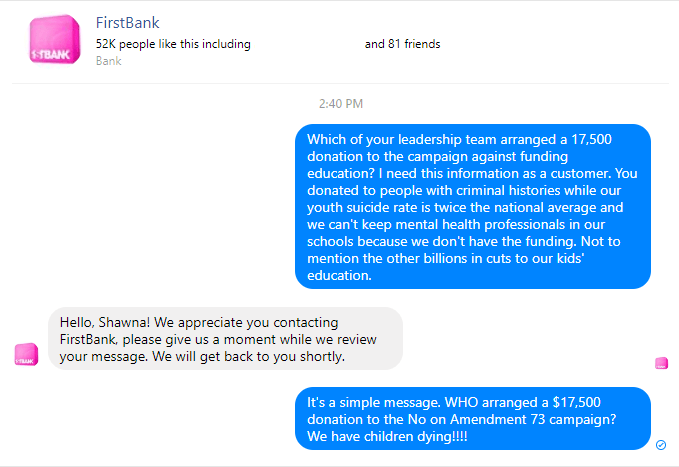 Unfortunately, FirstBank did not ask for a presentation from the #YesonAmendment73 campaign and did not get involved, though the campaign has been ongoing since February 2018. Additionally, Great Education Colorado, the Colorado Fiscal Institute, the Colorado School Finance Project, CASE, CASB, and Superintendents from across Colorado have been presenting information on the dire situation of education funding for years, but FirstBank has not received or requested any of those presentations nor engaged in the process during the 2 years these groups were working on what is now known as Amendment 73. FirstBank CEO Jim Reuter noted that their position was purely due to the economy. He was asked which economists he viewed information from and it was noted that FirstBank has no economists on staff. He noted that you can Google economic information to support anything you want to believe. The organizations and individuals crafting Amendment 73 are parents, educators, superintendents, legislators, economists, education policy experts, and attorneys well versed in education policy as their specialty. FirstBank has no staff dedicated to education policy. It was noted that FirstBank made an additional donation to the Jeffco mill and bond campaign in the amount of $7500 on the morning of October 24. COO Emily Robinson suggested that it was Shawna’s suggestion to do so, Shawna pointed out that the suggestion was a matching donation to the #YesonAmendment73 campaign because a mill and bond for 86,000 children is different than addressing education funding for 900,000 children and the timing so close to the election was poor and not helpful for 2018. CEO Jim Reuter noted that the impact to businesses (actually he misstated S Corporations and small businesses) was a 30% increase. First, the increase to C Corporations is 1.37% to a total of 6%, still leaving Colorado the 9th lowest in the country. For example, when your 1 year old child has a birthday and turns 2, you don’t say that your child aged 100%. Using math to deceive and scare people is the No Taxes Ever level 101 course. Some organizations, such as FirstBank, want to claim Amendment 73 would be detrimental to small businesses. This is not only inaccurate but following such advice will actually cause small businesses to miss out on an excellent economic stimulus opportunity. The main classification of business in Colorado that will be significantly impacted by Amendment 73 is C corporations. A C Corporation is a business whose profits are taxed separately from its owners under subchapter C of the Internal Revenue Code. A C Corporation is owned by shareholders, who must elect a board of directors that make business decisions and oversee policies. This clearly does not fit the definition of a small business. Rejecting Amendment 73 will actually mean most of our local small business owners will miss out on a significant reduction in their taxes. In fact, a small business owner earning up to $200,000 per year with a business value of $500,000 would actually experience a nearly $900 per year tax reduction in combined income and property tax. FirstBank noted that they also agreed that education funding was lacking but they refused to make a formal statement, particularly as FirstBank and not individuals, because they believed that would be misconstrued. They were asked what they believed to be the solution to our education funding issues and they said they didn’t know what the solution was. They really, really did not want to go on record and said they felt they were being backed into a corner because I asked if they would be willing to make this statement. We will note that the meeting, though really short and with no intention of actually talking in depth or seeking resolution in any way, was very cordial. Sadly, it was basically a PR move but we appreciated the opportunity to listen as well as to be heard though our comments were not deemed worthy of consideration, their minds were already made up. FirstBank wanted to ensure it was known that they have made over a million in donations to education over the years. They mentioned donations to multiple nonprofit organizations, which do fantastic work, but these nonprofit groups are not the same as funding public education. They should be extras for children rather than groups attempting to fulfill the basics of a public school system. It also must be noted that one time funding cannot purchase staff or be used for salaries because one time funds are not ongoing and cannot be depended upon for budgeting purposes. Not only is this statement and many others made by FirstBank staff inaccurate, and insulting to a former educator, current staff, and parents, but it is electioneering activity. Companies can donate their employee time to campaigns but they must report the employee time in a donation report to the campaign, so we hope that FirstBank will comply with the Fair Campaign Practices Act and report all of the time spent giving our friends the talking points of the No on Amendment 73 campaign. We are grateful to those of you who sent us notes as well as audio of these conversations to ensure transparency. Shawna ensured that FirstBank was aware of the reporting requirement upon leaving the meeting. Watch for that donation on TRACER! It also should be noted that the call for this meeting came after 4pm on October 24th and Shawna returned the call and confirmed the meeting on the morning October 25th. 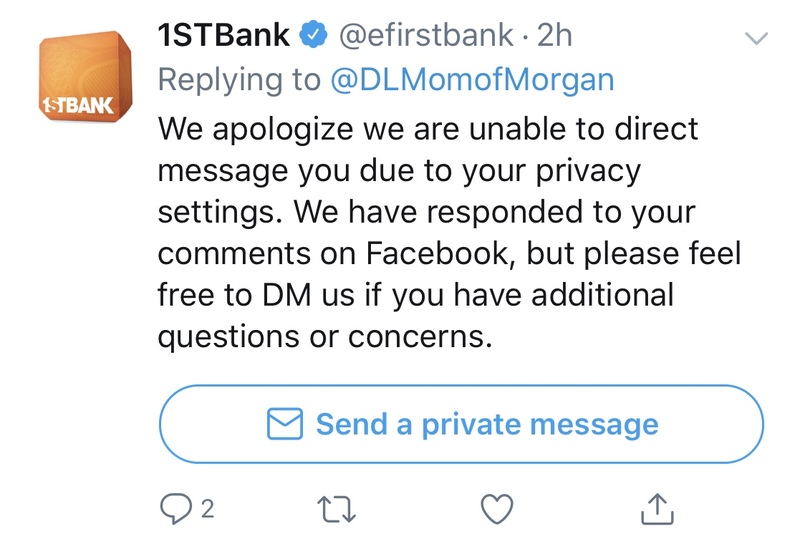 Interestingly, a call was made to a friend by a VP of FirstBank asking how to “handle Shawna.” We’ll just let you insert your own thoughts and response to that item. Shawna did contact COO Emily Robinson regarding this statement/call being made and she denied knowledge and didn’t know if this conversation had taken place so couldn’t comment. Once Ms. Robinson confirmed that it had, in fact, occurred she did follow up with a very genuine apology and noted that it was inappropriate. HR has a bit of employee training to do here. Ultimately, we just can’t support a company that is making money from our accounts with $2 per month credit card fees, interest earnings, and fees if there’s any possibility they would do this again and based on their defense of the activity, we think they very well may do it again. While Mr. Reuter was sympathetic to the suicide and crisis issues that are ongoing in all schools, they still defended not only their opposition but also the large donation on the back of an economic standpoint without having a consultation with an experienced economist. It really is the true definition of Classrooms vs. Corporations. Hoping that we will get one time donations just isn’t a way to fund the education of 900,000 children nor is it a way to attract and retain teachers and other education staff. Still, that $17,500 could have funded one teacher for half a year or 2 paras to help in classrooms. That would have been a more ethical donation. While we want to believe that FirstBank wants to support better funding for education, it would be more credible if FirstBank hadn’t made such a donation and tied themselves to some pretty unethical individuals. And it would be MUCH better if FirstBank just hadn’t made a donation at all, knowing the number of people in this community tied to education and who genuinely care about properly funding our schools. If you’re not aware of what’s been going on, you’re not alone. Initially, Shawna was just emailing and sending messages to FirstBank attempting to get a response about the donation. The initial link was only made available on Shawna’s personal Facebook page and a link to our website to explain and capture more of the story for friends was made but it wasn’t advertised on our platforms. It went quite viral anyway and we thank you all for your support in this really upsetting turn of events with FirstBank. However, now that this is “finished” and FirstBank has made it clear that they are firm in their decision to oppose statewide school funding, we also think the education community deserves to have the facts. Oh FirstBank, what were you thinking??? We expect the typical tea party folks, the uber wealthy who don’t want to pay any taxes at all, the school privatizers, and the extremists but take a look at the donation on September 21. (PS – All of this is available to you on reports in the Colorado Secretary of State Tracer site. FirstBank! Seriously! An institution that says they support public education. While it’s true that they did indeed make a donation to We Are Jeffco for $10,000 to support the mill and bond, they haven’t always made donations to those mills and bonds in the past. But seriously, FirstBank made a $17,500 donation to the group opposing fixing our education funding in Colorado. They didn’t just not support Amendment 73, they actively made a large donation against it! As a customer, I immediately sent several messages and emails. When they didn’t respond promptly, I took to Facebook to let others know about this donation. Well, they finally responded via private message, on Facebook, and via email – all with the same cut and paste response. But not before they first lied to me. You shouldn’t Tweet a response telling someone to check for a message they sent you and then tell the same person they can’t send you messages in private after tell you they already did it. Good evening. Please know FirstBank is a strong supporter of a well-funded public education system, and we believe educational funding is extremely important. In fact, education is one of our main pillars of giving, and over the years, weve contributed millions of dollars to public school systems, higher education scholarship programs and nonprofit organizations that help make quality education more accessible. That said, we reviewed Amendment 73 in great detail, and found that this measure places a large financial burden on small businesses, who would ultimately be the biggest funder of the $1.6 billion tax increase. This would have far-reaching, negative implications on job creation and economic growth in our state, as over 90 percent of Colorados economy is made up entirely of small business. Its estimated more than 11,000 jobs would be lost annually in private sector jobs alone as a result of this tax increase, according to findings by several nonprofit business groups. While we support educational funding and improvements to our education system, we do not believe Amendment 73 is the right approach. If you have additional questions or concerns, please let us know. For further assistance, please contact a 24 Hour Customer Service Representative anytime at (800) 964-3444. Thanks Rachel, for the cut and paste response, we ALL got the same response and that shows a lack of care and attempt to silence your customers who are upset. However, I’m well aware that FirstBank did not ask for or even attend or invite a speaker for a presentation about Amendment 73 to get the facts. You simply can’t say that you looked into anything while having ZERO education policy experts on staff and a limited number of attorneys who do not specialize in education funding or education anything and claim that you “looked into” anything. You didn’t invite the campaign, you didn’t invite the Colorado Fiscal Institute, you didn’t invite the Colorado School Finance Project, and you didn’t invite Great Education Colorado. You invited no one and no experts at all. We just finished the Safety and Security Task Force in Jeffco, if you had any idea the dangers our children and staff were facing every day, you’d be a fool not to invest in education after the cuts our children and staff have endured. Are you aware that our youth suicide rate is DOUBLE the national average and we can’t pay behavioral health specialists to stay in our schools? Not to mention the many other safety and security needs. While you made a $10,000 donation to We Are Jeffco (for 86,000 kids), there are more than 900,000 students in Colorado schools. $33 million with a ratcheting down Gallagher rate will do NOTHING to make a dent and we’ll have to go back to the voters yet again in just a few years. You made a 17,500 donation to promote a dark money group associated with Koch money to promote actively campaigning against children. You could have given We Are Jeffco that additional $17,500 knowing there are more than 500,000 people to reach in Jeffco. You didn’t just oppose Amendment 73, you used the money you make from customers to donate to opposing a campaign for funding. Funding that would still leave Colorado BELOW the national average. I am shocked, dismayed, and disgusted to see FirstBank joining in a donation to this group. Those of us in the education community often disagree but we all have each other’s backs and because we are the community, the business members, the parents, the teachers, the classified staff, the principals, and the economic backbone of this community, we benefit by always working with each other. Jeffco Schools is the largest employer in the County, how many of those staff members do you think have accounts with you? How many of our organizations? How many of the PTAs I referred to you support Amendment 73 (all of them including their County Council and State PTA) and are donating and volunteering to finally have a chance to fund our schools at a rate that will STILL BE BELOW THE NATIONAL AVERAGE!!!! There’s the guy on committee as the registered agent and then there’s the address on the committee. A quick trip to the County Assessor’s website shows that it isn’t the registered agent who owns that townhouse. For months Colorado Confidential has been reporting on the various misdeeds and assorted escapades of the Trailhead Group, a Republican political committee that has raised millions of dollars in efforts to boost the candidacies of Republican candidates around the state. Trailhead has engaged in some questionable accounting of its funds and has been accused of running misleading advertisements, and one of those charges has finally caught up with Trailhead director Alan Philp. Colorado Confidential’s Cara DeGette reported on the possibility of criminal charges against Trailhead several weeks ago, and it looks like those charges have come to fruition. Alan Philp, executive director of the Trailhead Group, is expected to be charged criminally this morning in El Paso County for airing a political ad that was “recklessly and willfully false,” according to a Trailhead attorney. Attorney John Zakhem, who represents Trailhead, a conservative campaign group organized by Gov. Bill Owens and wealthy Republicans, confirmed that Philp will be charged this morning. Attorney Scott Gessler, who is a friend of Philp’s, said in an e-mail, said he will be charged with a misdemeanor for recklessly or willfully making a false statement intended to influence an election. Despite the independent legal opinion of the Secretary of State, they don’t seem to care that they’re hurting our children and schools and they keep repeating the lie! Do you really think the Library Associations and Fire Chiefs and personnel would be supporting Amendment 73 if this were remotely true? Of course not! We are so grateful for both journalists and the Colorado Secretary of State Tracer website. If it weren’t for them, we wouldn’t know about the $334,500 this group calling itself the Colorado Economic Leadership Fund donated to the No on Amendment 73 campaign to oppose funding public education or the connection to the damaging Fix our Damn Roads group that is run by the Independence Institute. Be sure to see our EXTREME CAUTION on 109 article! The Bahamas is definitely close to Colorado, just 1,994 miles or a quick 4 hour plane ride! That’s right! If you support economic leadership for Colorado, you definitely have a mailing address in the BAHAMAS! 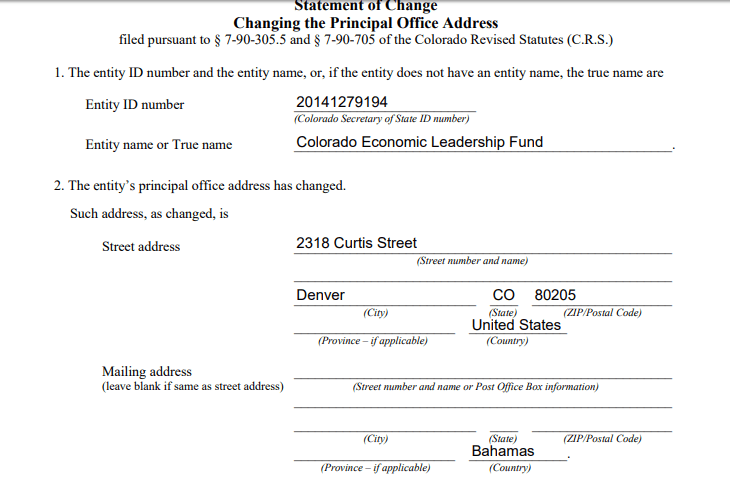 COLORADO ECONOMIC LEADERSHIP FUND DENVER, CO Monetary (Itemized) $50,000.00 10/5/2018 BLANK CHECK. BLATANT DECEPTION. VOTE NO ON 73. COLORADO ECONOMIC LEADERSHIP FUND DENVER, CO Monetary (Itemized) $284,500.00 9/24/2018 BLANK CHECK. BLATANT DECEPTION. VOTE NO ON 73. Looks like someone in the Bahamas (oops, “Colorado”) definitely wants control of the Colorado Senate! Who funds this Bahamas Colorado Economic Leadership Fund? It’s a 501c4 organization. That’s a nonprofit that can participate in political activity for both issues and candidates but does not have to disclose donors. “The Colorado Economic Leadership Fund is a nonprofit group formed in 2014. It doesn’t have a website, nor is it registered as a political committee with the Secretary of State. “In 2016, Anadarko Petroleum donated $510,000 to the group, while Noble Energy gave $25,000. “Advocacy groups funded by and sympathetic to oil and gas interests, such as the Colorado Economic Leadership Fund, have also been running ads on TV urging people not to sign the petitions. “Indeed, the stakes are high for those with financial interests in the oil and gas industry. Why would economic leadership oppose education? Strong schools promote economic growth! The Bahamas looks like a nice place to visit if you can afford it, but let’s let Colorado citizens decide what is best for Colorado. Corporations don’t have a vote like the people do. Colorado ranks 48th in the nation in per pupil spending per $1,000 of income. Also, Colorado ranks 38th in overall per pupil spending. Since the inception of the “BS” factor schools have lost $7.3 billion (yes billion). Colorado is $2,800 per pupil below the national average (again, your $13,000 per pupil is not adding up).Colorado is 49th in the nation for a competitive teacher wage and over 50% of the districts are now on a 4 day week to try to save money and attract teachers (we currently have a 5,000 teacher shortage in the state). I realize that Colorado has a flat tax. However, when taking all taxes into consideration the tax code is upside down. This information is directly from the Institution on Taxation and Economic Policy. When taking all the taxes paid (not just state but federal and local as well), the less you make in Colorado, the more of a percentage your income goes to taxes. For example, if one makes $12,300 per year, 7.6% of your income goes to taxes. If you make $30,000-$52,000 per year, 8.7% of your income goes to taxes. If you make $79,000 per year, 8.3% goes to taxes. If you make $140,000 per year 7.1% of your income goes to taxes. If you make $317,000 per year, 6.3% of your income goes to taxes. If you make $1.7 million a year, 5.3% goes to taxes. When this passes all categories will stay exactly where they are with the exception of those making $317,000 per year (they will go from 6.3% to 6.9%) and those making $1.7 million (they will go from 5.3% to 7.1%). Still not equal, but closer. Doesn’t sound like hating the rich and running them out of the state when 92% of Colorado will still be paying a higher percentage of their income to taxes. You never even mention the tax breaks many will see. For C-Corps the federal level was set at 35%. The additional tax on C-Corps in Colorado is an additional 4.63% making the rate in Colorado at 39.63% (which by the way is the 3rd lowest state tax rate of the 33 states that charge an additional C-Corp tax. Don’t even try to tell me that states like Texas are cheaper for C-Corps because they are not. They don’t pay a state tax but they do pay a franchise fee that is equal to or higher than the Colorado state tax) But something happened earlier this year. Something called a 14% tax cut for C-Corps federally which equates to C-Corps dropping to 21%. What we propose is that instead of the entire 14% being cut in Colorado that we add an additional 1.37% onto the existing 4.63% making it a round 6% for Colorado. So instead of Colorado C-Corps being at 25.63%, they would be at 27%. C-Corps actually see a 12.63% tax decrease overall. Low and behold, Colorado would now be the 9th lowest C-Corp rate in the nation of the 33 states that charge a C-Corp tax. And, the last part you make no mention- the tax cut for all other businesses (S-Corp, LLC, Sole Proprietor etc…) and the homeowner. If you own your business and the land that it’s on, you will see a 5% property tax decrease for that portion of your property taxes go to your local district. If you own your home you will see a .02% tax cut. I’m not too sure how a 12+% tax decrease for corporations and a .02% tax decrease for residential and a 5% tax decrease for all other businesses that are not c-corps results in massive tax hikes for business. Run the tax calculator. I’ve actually seen where a person making $300,000, with a $250,000 home and a $300,000 passthrough on their LLC gets between an $800-$1200 Tax cut per year. I am not exactly sure where you’re seeing the business tax increase. But I’m sure it has everything to do with the fact the TABOR requires The ballot language and the bluebook language be written in a specific way. You have to remember that there are three parts to this amendment. First is The income tax increase for 8% of Colorado. Second is the 1.37% tax increase for c-corps. However, they actually see a 12+% decrease when combined with the federal tax cut rather than the 14% tax decrease that was given to them federally. And the third part is trying to address portions of the Gallagher amendment. If you are not a c-Corp you will see a 5% tax Decrease (to 24%) on the property you own. That decrease will only go to the portion that applies to schools. Gallagher requires 29% on the other special districts. And that has not changed due to this amendment. Your residential property will drop from 7.2% to 7%. There’s always an excuse. Why is it that education initiatives always face opposition? We’ve defunded education for over a decade at this point and children don’t get to redo their years in school. What we have taken away from them in services has NEVER returned. 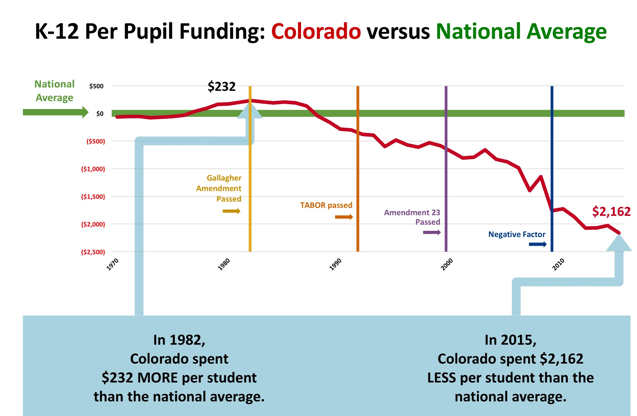 Colorado needs to spend between $2,000 and $2,800 more per pupil to meet the national average. Yet, here come the folks who not only don’t want to have to pay for education, they actually file a campaign and are planning on spending $$$ against our teachers and children! And they have “talking points” so here we go! They formed a COALITION to oppose children and teachers! THE COALITION INCLUDES: Colorado Bankers Association, Colorado Restaurant Association, Associated General Contractors, Colorado Association of Mechanical and Plumbing Contractors, Colorado Association of Realtors, Denver Metro Commercial Association of Realtors, Denver Metro Chamber of Commerce, Colorado Competitive Council, Ready Colorado, Independence Institute, Colorado Rising Action, Colorado Farm Bureau, Americans for Prosperity, Building Jobs4Colorado, South Metro Denver Chamber of Commerce. Same people who like to say our schools are failing, our children aren’t good enough, and those who work to privatize public education. One has to wonder why some of these groups put their names alongside dark money organizations. Do they benefit from that money too or are they just ignorant of the facts? MYTH – Amendment 73 is a $1.6 billion per year blank check. TRUTH – they want local control, yet when it’s given to them, they still complain. Local control is also needed because 178 different Colorado school districts have made different cuts and have different populations that have different needs. GO TO A COMMUNITY BUDGET FORUM AND ADVOCATE FOR THE SERVICES YOU THINK WE NEED! MYTH – Amendment 73 is being sold as a big benefit for teacher pay and new school buildings, but the reality is the measure has no guarantee that the funds will be used for those purposes. A big portion of the money will go toward administrators, overhead and the huge education bureaucracy. There are zero guarantees teachers will get all or even most of this enormous tax hike. MYTH – Backers of the measure have openly bragged that school districts can spend the money however they want. That’s why there is little doubt that a significant portion of the tax increase will go toward administrators, overhead and the education bureaucracy. Currently, only 55 cents on every dollar goes to pay teachers. TRUTH – Huge administration is the myth floated by the tea party groups and a method of pitting teachers against administrators and parents against administrators. While all districts have varying percentages of administrators, in Jeffco, only 4% of all staff are administrators. Who watches Jeffco budget and oversees how money is spent? The Board of Education authorized the establishment of the Capital Asset Advisory Committee in accordance with Policies EL-8 and FB, both of which deal with facility condition and long range facility planning. The Committee was formed from members of the 2005 Capital Improvement Program Oversight Committee and the 2009 Facilities Usage Committee. The purpose of the Committee is to monitor the planning of capital needs and the implementation of capital programs, which may include future bond programs. Members have a working familiarity with facility design and/or construction practices; business management expertise with organization(s) of comparable size to the district, and are independent and free from any relationship that would interfere with independent judgment. Preference is given to Jefferson County residents. As part of Jeffco Public Schools effort to reduce costs and identify efficiencies, the district examined all areas of operation, including how schools and facilities are used throughout the district. More than 30 community and district volunteers were chosen to serve on a Facilities Usage Committee in early 2009 to help the district determine the most efficient and effective use of its buildings. The work of the Committee will be ongoing. The Facilities Usage Committee provided options to the district for an efficient use of all district facilities where educational services are provided that align with the Board of Education Ends Policies and the district mission of educating all students for a successful future. assess the business risk of the district; and the district’s auditing, accounting and financial reporting processes generally. Consistent with this function, the Financial Oversight Committee should encourage continuous improvement of, and should foster adherence to the district’s policies, procedures and practices at all levels. Jeffco Schools was recognized and awarded for transparency! Jeffco was one of the first school districts to create an online searchable database for the public to use. The district is committing to providing an easy-to-use, clear view of how taxpayer dollars are spent by listing expenditures by fund. Jeffco’s financial transparency website was recently awarded an “A” by the editors of Sunshine Review. Editors at Sunshine Review analyzed more than 6,000 government websites and graded each on a 10-point transparency checklist. Editors looked at content available on government websites against what should be provided. They sought information on items such as budgets, meetings, lobbying, financial audits, contracts, academic performance, public records and taxes. The winners of the Sunny Award all received an “A” grade during the extensive grading process. Only 214 websites were awarded! The 2012 Bond is complete with projects on-time AND under budget! Look at the tremendous amount of work that’s been done! The truth? Jeffco has only 4% administration. That’s lower than nearly every district in the state! You can oppose taxes all you want. If you choose to do that, then you need to find a way to fund the services our community needs to provide in another way. That’s not through lottery tickets, not through casinos, not through marijuana, and not through any other creative scheme that shows you pictures of children. What you shouldn’t EVER do, is hurt and negatively impact the lives of children by telling lies, spreading misinformation, or inaccuracies about education funding. Are these good for our kids? MYTH – Amendment 73 totally undermines the state’s voter-approved TABOR state spending limits. By exempting education – the largest program in the state’s budget – from the state spending cap, Amendment 73 is a backdoor scheme to allow big-spending politicians to cost-shift and spend unlimited amounts of tax money on other programs also. Amendment 73 is a blatant deception. TRUTH – Who are these big spending politicians???? It’s OBVIOUS that cuts to education have occurred! Send some big spending politicians our way, we want to talk to them!!! As parents, we’ve been begging for years! We gave more per pupil funding to students in 1990 than we do today! The only people who can increase taxes in Colorado are VOTERS! And TABOR? We’ve made national news! The nation is laughing at us! MYTH – Amendment 73 is being sold as a tax increase on wealthy CEOs and big corporations, but that’s dishonest. Amendment 73 triggers a massive income tax increase on tens of thousands of small businesses, farms, middle income married couples, and each and every homeowner in Colorado. Some of Colorado’s best-known and most vital employers would be hit with tax increases as high as 78 percent. 9th lowest corporate tax rate among the 44 states with such taxes. For business property owners, farmers and ranchers, they will see a tax decrease of about 17% on their school property taxes when nonresidential assessment rates are reset. Even the 1% in the highest tax bracket will still pay less of a percentage of their income than teachers, police officers, and other hard-working middle class Coloradans. In order for Initiative 93 (now known as Amendment 73) to clear the Title Board Hearing, it had to meet the Single-subject Requirementin the state’s constitution. must unambiguously state the principle of the provision sought to be added, amended, or repealed. Every proposed constitutional amendment or statutory proposition must be limited to a single subject, which must be clearly expressed in its title. In other words, the text of the measure must concern only one subject and one distinct purpose. For additional information relating to the single-subject requirement, see Article V, Section 1(5.5) of the Colorado Constitution and section 1‑40‑106.5, C.R.S. About Amendment 73 & how it stabilizes local level funding for public education. Public education is the only local level funding the state is required to backfill. Because of Gallagher, the personal property assessment rate has fallen from 21% in 1982 to the current 7.2%. The Commercial rate has remained at 29%. Commercial property owners carry the burden while personal rates fall, creating a funding crisis for our schools (as well as fire districts, water districts, and many other services). Amendment 73 addresses this issue /crisis for public school funding, by dropping the current 7.2% to 7.0% and holding it there to prevent further loss of funding – for public education only. 73 also provides long over due relief to commercial property owners (business owners, farmers, and ranchers) by dropping the commercial rate from 29 to 24% and holding it there to prevent any fall in future local funding for education. Please note these stipulations to Gallagher assessment rate are only for education. This is why fire districts, park districts, etc. often put their own mill levy initiatives on the ballot. To fix this issue, these districts can also file initiatives (just as we did with Initiative 93/Amendment 73) but they must be single subject, as the constitution requires! Without this fix, these special districts will continue to decrease in funding, just as education has over the years. Is it more work for county assessors? Yes, but we’ve all used formulas and calculations in spreadsheets. It’s not that hard to reformulate a calculation in a computer program. They can do their assessment spot check as usual, they just get to do an extra calculation. Several County Assessors and candidates are supportive of Amendment 73, Jeffco candidate Scot Kersgaard even carried a petition! I am so very disappointed and your response speaks volumes as to your true interest in public education. I highly doubt that your employees, many of whom have children in schools and spouses and family members working for our district, would approve of whomever made this bonehead decision. I have spoken to several other banks this morning to check in as I decide where to move my accounts and several of their VPs stated that they would never dream of participating in such a dreadful decision to oppose school funding in any form. They’re also quite eager for the business I can send to them. Tell me what is needed to close my accounts with you as that is what I intend to do while I take the time to ensure everyone I know is aware of what you’ve done. You should apologize to so many of us and you should be making a $17,500 donation to the Yes on Amendment 73 campaign and at least one more to every single school in every district where you have a bank. Corporate greed will eventually show itself, thanks for making sure that we are aware of what you really stand for. I know how poorly your tellers are paid, perhaps you should think about using that money for bonuses for them and other staff. Thanks so much! I’ll be in to close my accounts soon and don’t be surprised if you see a mom with a sign standing on public property outside your banks after I’m done volunteering my time for the election and for children!